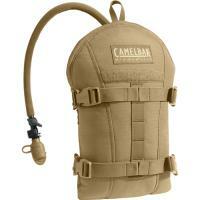 The CamelBak ArmorBak Hydration Pack is designed to integrate into your ballistic armor system. Its side-release buckles make it quick and easy to attach to an IOTV or MTV vest, or any other design with MOLLE or PALS webbing on the rear panel. The Direct Armor Attachment System means that it will not interfere with quick release mechanisms. It also features a Quick Attach Pressure Strap that wraps around to stabilize the load and increase internal pressure for quicker flow. The pack contains a mil-spec Antidote reservoir that features a silicone Big Bite Valve with one-handed Hydrolock flow control for convenient access. Its insulated PureFlow tube preserves freshness and temperature, and the large fillport makes refilling simple.